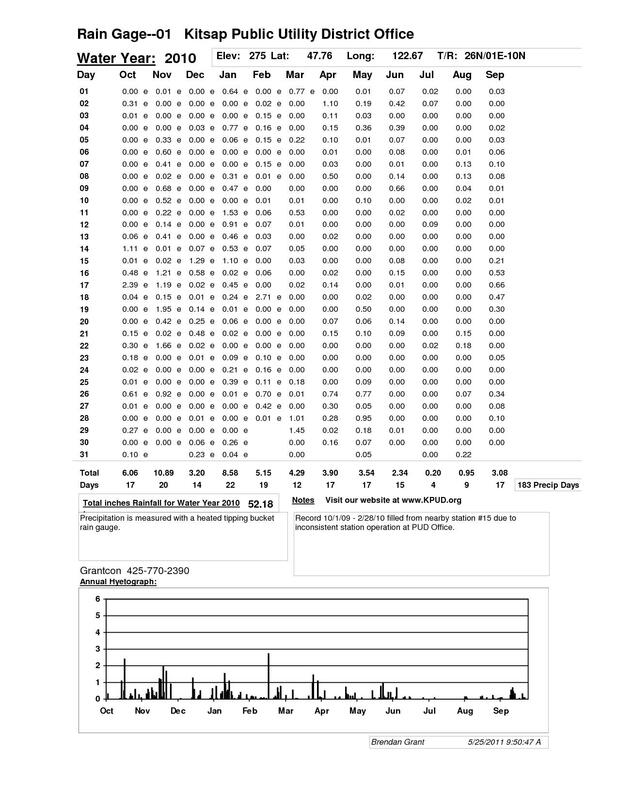 Select rain gage below to view yearly summary list. 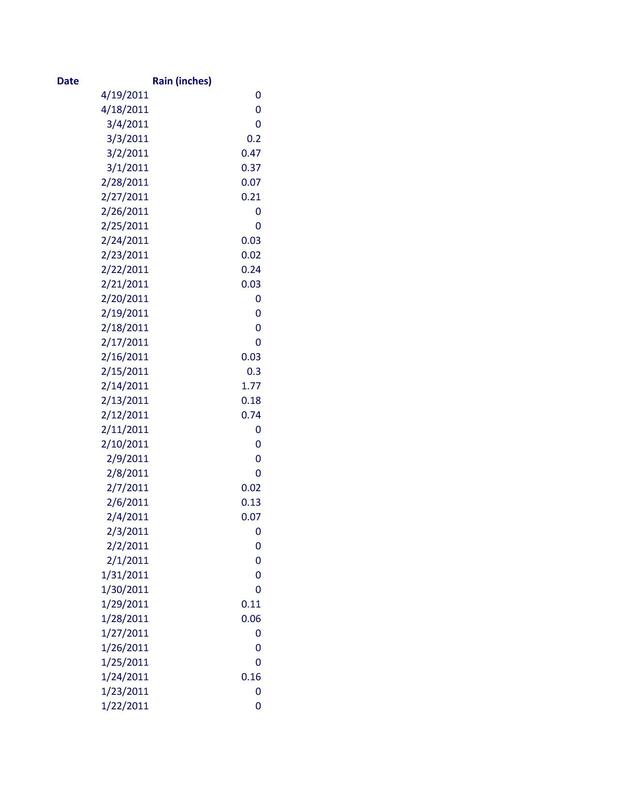 Select from yearly summary list for daily data. Records will list below chart or can be downloaded text file via button to right. 01 Kitsap Public Utility District Office--Updated-- Apr 24 2019 8:10AM-- Rain Total For Today-- 0.00 03 Indianola - Miller Bay--Updated-- Not telemetered-- Rain Total For Today-- 04 City of Poulsbo - Big Valley Well Site--Updated-- Not telemetered-- Rain Total For Today-- 05 Bloedel Reserve - Shop--Updated-- Not telemetered-- Rain Total For Today-- 06 Bremerton National Airport--Updated-- Not telemetered-- Rain Total For Today-- 08 BWU - Olympus Drive--Updated-- Not telemetered-- Rain Total For Today-- 09 BREMERTON, WASHINGTON--Updated-- Not telemetered-- Rain Total For Today-- 10 Fish Pro - Burley--Updated-- Not telemetered-- Rain Total For Today-- 12 Sakai Intermediate School--Updated-- Not telemetered-- Rain Total For Today-- 13 Coulter Creek Hatchery--Updated-- Not telemetered-- Rain Total For Today-- 15 Poulsbo - Private--Updated-- Not telemetered-- Rain Total For Today-- 16 SWD - Dawn Park--Updated-- Not telemetered-- Rain Total For Today-- 18 BWU - Gorst @ Domsea--Updated-- Not telemetered-- Rain Total For Today-- 22 Grover's Creek Hatchery--Updated-- Not telemetered-- Rain Total For Today-- 24 Hansville--Updated-- Apr 24 2019 8:10AM-- Rain Total For Today-- 0.00 25 Holly Beach Club--Updated-- Apr 16 2019 9:10PM-- Rain Total For Today-- 26 Illahee - Private--Updated-- Not telemetered-- Rain Total For Today-- 27 Port Orchard - Private--Updated-- Not telemetered-- Rain Total For Today-- 28 Port of Kingston - Port Office--Updated-- Apr 24 2019 8:10AM-- Rain Total For Today-- 0.00 31 BWU - McKenna Falls--Updated-- Not telemetered-- Rain Total For Today-- 32 Meadowmeer Golf Course--Updated-- Not telemetered-- Rain Total For Today-- 34 Olalla - Private--Updated-- Not telemetered-- Rain Total For Today-- 35 Port Gamble--Updated-- Apr 24 2019 8:10AM-- Rain Total For Today-- 0.00 37 Scenic Beach State Park @ Seabeck--Updated-- Not telemetered-- Rain Total For Today-- 38 Seabeck - Private--Updated-- Not telemetered-- Rain Total For Today-- 39 SWD - Wixon Site--Updated-- Not telemetered-- Rain Total For Today-- 40 Stavis Bay - Private--Updated-- Not telemetered-- Rain Total For Today-- 41 Tracyton - Private--Updated-- Not telemetered-- Rain Total For Today-- 42 BWU - Twin Lakes @ Well #20--Updated-- Not telemetered-- Rain Total For Today-- 46 Hansville Road - Private--Updated-- Not telemetered-- Rain Total For Today-- 49 West Sound Utility District--Updated-- Not telemetered-- Rain Total For Today-- 50 WA Water Company - Purdy--Updated-- Not telemetered-- Rain Total For Today-- 51 SWD - Nels Nelson @ East End--Updated-- Not telemetered-- Rain Total For Today-- 52 SWD - Crista Camp @ Island Lake--Updated-- Not telemetered-- Rain Total For Today-- 53 Gala Pines Weather Station--Updated-- Apr 24 2019 8:10AM-- Rain Total For Today-- 0.00 56 Indianola - Private--Updated-- Not telemetered-- Rain Total For Today-- 59 Edgewater Industrial Park--Updated-- Apr 24 2019 8:10AM-- Rain Total For Today-- 0.00 61 BA - SSWM (Bremerton National Airport)--Updated-- Apr 24 2019 8:10AM-- Rain Total For Today-- 0.00 62 Silverdale--Updated-- Apr 24 2019 8:10AM-- Rain Total For Today-- 0.00 63 AP - SSWM (Airport Park)--Updated-- Not telemetered-- Rain Total For Today-- 64 Purdy - Private--Updated-- Not telemetered-- Rain Total For Today-- 65 Theler Center--Updated-- Not telemetered-- Rain Total For Today-- 66 Sunny Cove--Updated-- Not telemetered-- Rain Total For Today-- 67 Bridletree--Updated-- Apr 24 2019 8:10AM-- Rain Total For Today-- 0.00 70 Kitsap County Fairgrounds Pavilion - Bremerton--Updated-- Apr 24 2019 8:10AM-- Rain Total For Today-- 0.00 71 Kitsap County Central Road Shed--Updated-- Apr 24 2019 8:10AM-- Rain Total For Today-- 0.00 72 Kitsap County South Road Shed--Updated-- Apr 24 2019 8:10AM-- Rain Total For Today-- 0.00 74 Hansville Recycling and Garbage Facility--Updated-- Not telemetered-- Rain Total For Today-- 75 Suquamish Village--Updated-- Apr 24 2019 8:10AM-- Rain Total For Today-- 0.00 76 RAGF--Updated-- Apr 24 2019 8:10AM-- Rain Total For Today-- 0.00 77 BWU - Oyster Bay--Updated-- Not telemetered-- Rain Total For Today-- 78 South Bainbridge Island--Updated-- Apr 24 2019 8:10AM-- Rain Total For Today-- 0.00 Rainfall records represent a point sampling of rainfall amounts. Topography and local conditions can cause nearby sites to accumulate different amounts of rain over a period. The accuracy of our records is assured by regular maintenance and calibration o f the equipment. Where equipment failure creates a gap in the record, the missing period is estimated with data from nearby rain gages or volunteer observers. 2019_____27.52" 2018_____44.93" 2017_____59.73" 2016_____58.62" 2015_____40.65" 2014_____36.72" 2013_____50.91" 2012_____40.74" 2011_____50.88" 2010_____52.18" 2009_____27.81" 2008_____35.39" 2007_____44.93" 2006_____31.79" 2005_____30.64" 2004_____45.88" 2003_____38.68" 2002_____45.48" 2001_____29.42" 2000_____41.10" 1999_____62.16" 1998_____47.99" 1997_____54.89" 1996_____46.94" 1995_____52.55" 1994_____33.48" 1993_____34.13" 1992_____37.86" 1991_____40.09"
Precipitation is generally measured with a tipping bucket rain gage. Ice and snow accumulations in the rain gage are not measured until they melt. Precipitation from snow is not measured accurately..